A splash of balsamic vinegar makes these Slow Cooker Caramelized Onions irresistibly good. You’re going to need a stash for your freezer! I recently posted a recipe for Pumpkin Pizza with Caramelized Onions and made caramelized onions the traditional way. Of course, they were delicious and a vital topping for the pizza. But, I usually don’t have time to stand over the stove-top and keep vigil over the onions for the length of time required. The entire time I wistfully glanced over at my freezer and wished some caramelized onions stowed away. It was time to pull out the crock pot and restock. For the most part, I make caramelized onions in the crock pot like everyone else does. Slice the onions, toss them with olive oil and allow them to slow cook on low for 10 hours. The one thing I do just a bit differently than most…I stir in a splash of balsamic vinegar at 10 hours, place the lid ajar and allow some of the liquid to evaporate for the next hour. The balsamic vinegar enhances the color and taste. But, it doesn’t overwhelm the onions at all. I also drain the onions before packaging them for storage. However, I don’t throw away the precious juice. Instead, I freeze it and use it to flavor soups or dishes where broth might be appropriate. 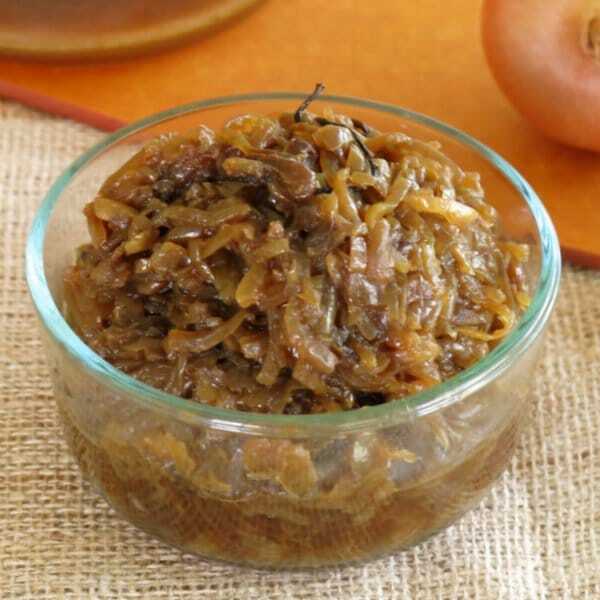 In any recipe that calls for caramelized onions! The list goes on and on and on. What would you do with a stash in your freezer? 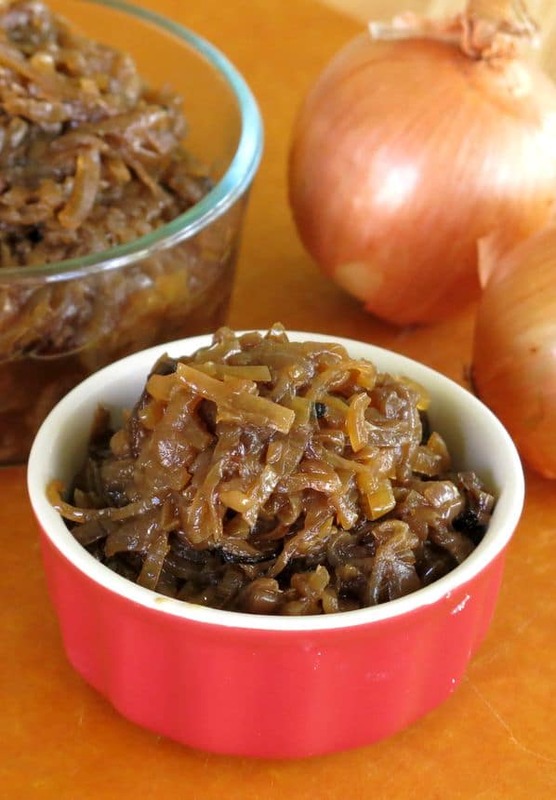 Dress up your next recipe with Slow Cooker Caramelized Onions! It's an easy, healthy and delicious way to give a dish pizzazz. Uniformly slice onions with a mandolin or knife. I used setting 3 on a mandolin. Place onions in slow cooker and drizzle with olive oil. Toss to coat all the onion slices. Cover and cook on low for 10 hours. Remove lid and stir in balsamic vinegar. Return lid and leave ajar to allow liquid to begin evaporating. Cook for 1 hour more on low. Remove onions from slow cooker. Place onions in a colander to drain off liquid. Liquid can be retained for another use. Portion and freeze onions in a freezable containers or plastic bags according to needs. 1/4 cup portion sizes work well. Love that you can caramelize onions in the slow cooker! This would be perfect when making French Onion soup because the onions would be ready when I get home from work! I’d have tears of joy too with knowing those yummy caramelized onions are in the freezer waiting to be used on so many things. This is brilliant!! What a great idea to have these at the ready in your freezer, I love caramelized onions. I have to do this for sure!! Love the added balsamic at the end!! I make caramelized onions all the time and can attest that adding balsamic vinegar is the way to go. It’s amazing how their flavor transforms with it. But I’ve never made them in my slow cooker. FABULOUS idea. Grrrreat idea to make a whole bunch of caramelized onions, freeze them and have them ready to go! Yum! Those are some great looking onions! You are BRILLIANT! I never would have thought to caramelize onions in a crockpot. Not only is this a breeze to do but the ease of freezing the onions and then simply pulling them out when needed is fantastic! 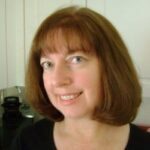 I am learning so many wonderful slow cooker tips today! I LOVE caramelized onions! They make most everything better, but I never knew you could make them in the slow cooker! I don’t use my slow cooker a whole lot, but you can be sure I will be making some caramelized onions in it, and I love your tip on adding the balsamic – yummm. Thanks, Marjory! It’s so nice to be able to get them all cooked at once, less tears in the end! I love the slow cooker caramelization method, I use it for garlic sometimes, too! It’s so nice just to be able to let it happen all by itself and have a big batch ready to enjoy later. They look great, Marjory! Great! So easy and so many possibilities! I’ve always wanted to try caramelizing onions my slow cooker! Adding balsamic is such a good idea and so easy. I’d like to eat some of those onions – just with a spoon! Those look seriously yummy! And never thought to make them in a slow cooker either – great idea! 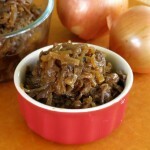 I love making caramelized onions but they get even better when made in the slow cooker. So easy! I love using my slow-cooker to make big batches of caramelized onions. It’s so nice to have all those caramelized onions around: like money in the bank! This sounds incredibly easy – and such an amazing end product! Yum! I’m definitely trying this – love the splash of balsamic vinegar you added. This is genius. I love this idea. Caramelizing onions for recipes adds so much time to my cooking, this is a great shortcut idea! Caramelized onions are one of my absolute favorite foods. I could eat all 3 of those cups by myself. Dare me? I had no idea you could caramelize onions in a slow cooker! Awesome! I use my slow cooker all the time but never have I just used it to carmelize onions, this is most certainly on my to do list for sure! I’m so excited to try caramelized onions in my slow cooker! This is genius! Thanks for the great recipe!! I like to keep a jar of these in my fridge to bump up the flavor in our weekly meals! I want to put these onions on everything! I had no idea that you could caramelize onions in the slow cooker! OMG – WOW! Why have I never made caramelized onions in the crock pot?! I’m a fiend for caramelized onions…a FIEND! Having a stash in the freezer would be awesome. Great idea! I love that it’s a slow cooker recipe and a freezer recipe all in one! Totally digging adding some onions on my pizza! This is one of my favourite things to make in my slow cooker. It’s so good to put on top of sandwiches and whatnot. This makes me want to whip up a batch immediately. I will be crying tears of joy once I slow cook my onions to caramelized perfection! I never even considered doing this in my slow cooker! THANK YOU, THANK YOU, THANK YOU!!! totally gonna try this! great post! We made this and used it all up on pizza so I’m off to make my next batch! Thanks for recipe.